EMERYVILLE, Calif., January 23, 2018 /3BL Media/ - The Standard, which establishes strict environmental and social requirements for farmed fish, is quickly gaining traction within the industry. Kurose Suisan achieved its certification on 16 December last year after an independent assessment, following the ASC multi-site approach, of three sites – Kushima, Uchinoura and Nobeoka Farms – by third-party conformity assessment body (CAB) SCS Global Services.Global Ocean Works’ certification was announced one week later on 22 December, following an audit of the Fukuyama Fish Farm by Amita, the local independent CAB. Kurose Suisan, operated by the Nissui Group network, has been producing Seriola since 2004 under the brand, Kurose Yellowtail, from its farms sites located in Kushima, in the Miyazaki prefecture in the south of Japan. Global Oceans Works, based in Tarumizu City, Kagoshima Prefecture Japan, was established in 2009 with a focus on processing and sale of ‘hamachi’ yellow tail. The ASC Seriola and Cobia Standard, launched just over a year ago, addresses the key negative environmental and social impacts associated with Seriola aquaculture. The standard sets measurable, performance-based requirements that farms must meet to be certified, including preservation of local habitats and biodiversity, minimising fish escapes, conservation of water and water quality, minimal use of therapeutics and antibiotics, and responsible sourcing of feed ingredients, including strict limits on the use of wild fish as an ingredient and full traceability back to a responsibly managed source. The Seriola standard also has a rigorous set of social requirements based on the core principles of the International Labour Organisation (ILO), including prohibiting the use of child labour or any form of forced labour. All certified farms are safe and equitable working environments where employees earn a decent wage and have regulated working hours. 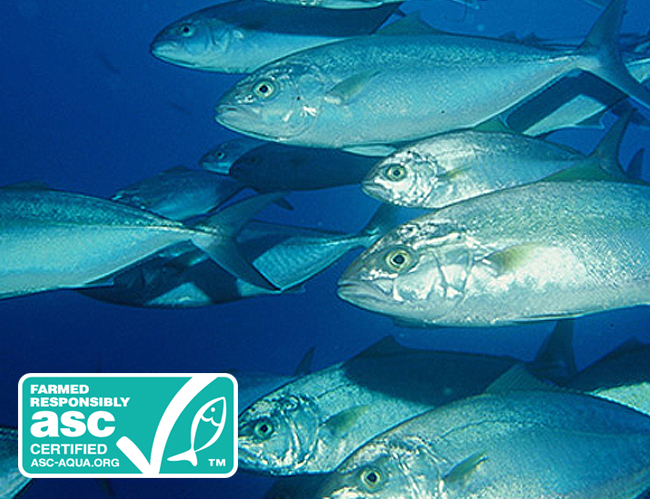 Learn more about Aquaculture Stewardship Council (ASC) Certification.